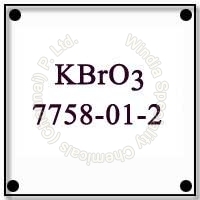 Windia Speciality Chemicals (Chennai) P. Ltd. is engaged in the manufacture and supply of superior quality Potassium Bromate in the international market. Potassium Bromate Chemical is chemically denoted as KBrO3 which is insoluble in alcohol. Potassium Bromate that we supply in the market is synthesized at our highly advanced in- house laboratory under the supervision of experts. Potassium Bromate is a strong oxidizer and is a very volatile chemical used in analytical chemistry. It is also used as an additive for permanent-wave compounds. In addition to this, we are regarded as one of the major Potassium Bromate Powder Suppliers in India. Insoluble matter % by weight = <0.003 These are packed in 25 kg HDPE woven sacks with inner lining and 25 kg HDPE drums.